Fall in love with all the shades of Purple. Psst…there’s a new color in town, trending all over the magazines and our brides’ Fall 2013 palettes, the varying shades of purple. We’re transforming the light & airy shades of stock, scabiosa (a delicate, tissue paper like bloom) to the deep, uber-chic hues of bold plums of dahlias, orchids and anemones into clap-worthy delights. This season calls for a mixed array of textures, varying shades, and a plethora of sophistication in bloom form. Purple has always exuded femininity, not to mention it looks fabulous in my dream Kate Spade Beau bag (yes, I added a pic below) or a deco violet scroll wallpaper, it’s simply divine. No wonder our brides are swooning over this palette. LOVE. LOVE. DESIGN. DESIGNER’S TIP: Look towards interior design and you’ll find your wedding inspiration. We believe in “the vision” and looking at an overall color scheme in a room is a whole bunch of (fabulous) inspiration to transform into a palette, an inspiration and a look. Modern Simplicity: Timeless can come in many forms. Keeping to a single bloom and/or placing it in an unexpected way, creates refined elegance. Bold Hues & Texture Galore: Look at those flowers above! You have all this gorgeousness mixed in deep shades that range from a true purple all the way to a cognac plum. Luxe, luscious, and utterly surprising. Wildly Romantic: Loose, lovely arrangements are the perfect look for incorporating an outdoorsy, wild flower look in subtle pops of purple softened by a mix of greens and pale shades of white. Classic elegance: Oh, how we love when blooms simply show themselves off. 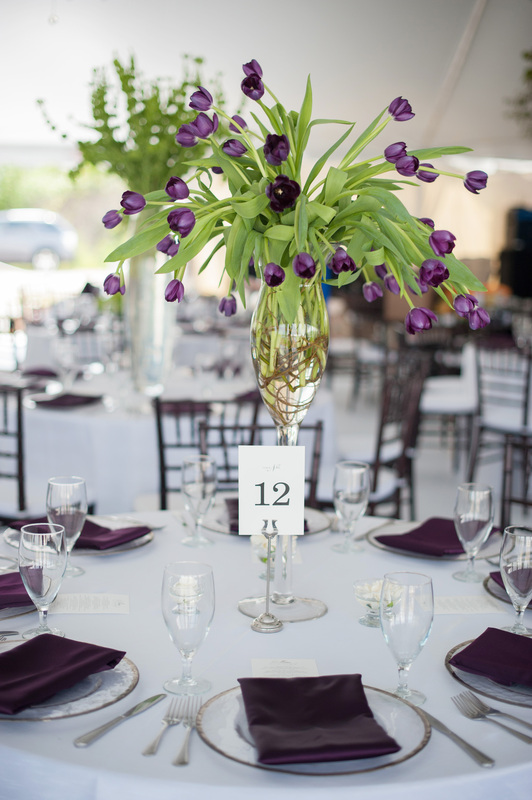 Tall groupings of tulips, draping over glass set the stage for understated elegance. 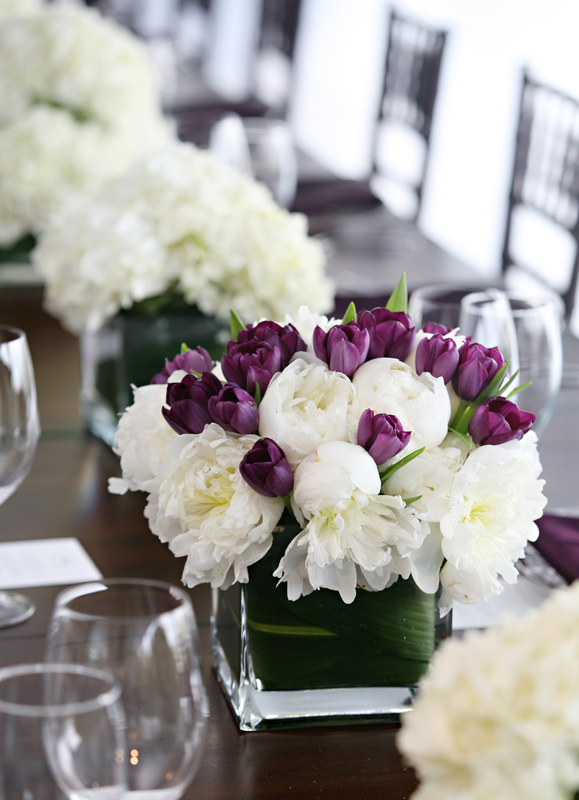 As does a selective “pop” of purple nestled within the delicate texture of peonies. Simply, delightful. Drool Worthy Accessories: Ahem, please meet Kate Spade’s Beau bag…and it may not be a flower, but I could sure design a killer party around this lil’inspiration.